It takes guts to name your house music project after one of the genre’s most revered records of all time. Jozef Lemmens and Pierre van der Leeuw, the Dutch duo who produce as Morning Factory, have more than intestinal fortitude — they have serious talent. After cultivating their musical tastes as record shop clerks and DJs across the span of two decades, the pair tried their hand at making the stuff in the mid-aughts. In 2010 their investments finally paid off when Yore Records and 20:20 Vision signed their first records, revealing a tech-edged house sound that has continued to evolve and take on new dimensions in their 2011 releases for Royal Oak, Fina Records and Pets Recordings. As one of house music’s most compelling new prospects, LWE tracked down Morning Factory to discuss their division of labor, their take on the Dutch dance scene, and the advice they would give young producers. They also provided us with our 105th exclusive podcast, a blistering 80 minutes of high quality house laced with vintage favorites and potential classics. How did you two meet and begin producing together? This must have been in the early 90s when we met as young kids in a record shop. Soon we became colleagues in that same record shop and worked there for many years. During this period, 1994 to late 2006 (when the shop went bankrupt), we were part of a collective of like-minded souls and co-hosted numerous parties. Carl Craig, I-F, Erol Alkan, The Glimmers, Freddy Fresh, Charles Webster and the DMX Krew were just a few names on the long list of great artists we as part of this collective had the pleasure to invite and DJ with. Anecdote: It seems that Francesco Tristano met Carl Craig for the first time at one of our parties. Francesco and a friend of his were there (we never met them though), which is quite funny in retrospect because this must have been one of the last parties we organized, in autumn 2005. Carl played an excellent set (still with vinyl in those years) and showed not only to be a pro but also a very warm and friendly person. Actually, we never really had the urge to produce and we were quite happy working in the record shop, being part of this party collective and DJing ourselves all those years. But after the shop went bankrupt the crew slowly but surely fell apart with people choosing different paths in life. We got together and soon came to the conclusion that we could never live without electronic music and decided we were ready and up for a next challenge, and so a new chapter began. Do either of you make solo productions as well? Yes, although not for official output. Maybe someday we might, who knows? And if so, we will always hook up and ask each other for an opinion or advise. However all this is not a serious topic for us as our main focus is Morning Factory. Is there a division of labor between you two in the studio? What does each of you bring to Morning Factory? Joep is more the technical guy and makes the first sketches and we take it from there. JP gives the input to compliment the production process. From there we work on the tracks until we have a piece of music that we feel comfortable with, as we agreed not to release music which is not up to our own satisfaction. Morning Factory is by all accounts a reference to the Ron Trent/Chez Damier track of the same name. How did that end up as the name for your project? In our opinion Ron and Chez are among those few who truly can call themselves legends. Simply because they created honest and original music, not a style, not a genre, no hypes, no trends. You still feel that today. 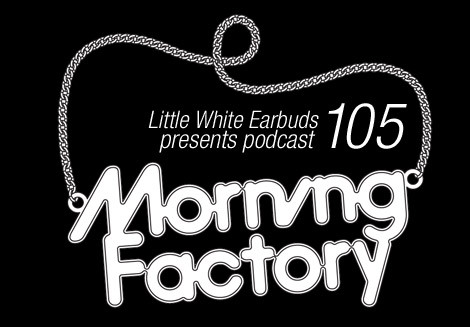 Their track “Morning Factory” was and still is a firm favorite of ours; that is why we choose the name. Mind, we don’t compare ourselves with Ron and Chez, neither do we want to copy their sound, which would be impossible anyway. What we do is follow our heart, try to aim for the best we can possibly be, listen, learn, love and enjoy all this great music which is still around, old and new. Earlier this year you posted a photo of your studio which was quite crowded with gear. With all that gear and only two years of releases, how long have you been producing? Oh yes, that one! Haha, we have to be honest here, it’s not ours! Both the picture and the gear belong to Jean-Michel Jarre (another legend). Our studio is not like that. We use software technology which can be at your fingertips nowadays as a substitute to all that great vintage equipment, which we still love. How much sampling do you guys do? Every now and than we sample some things out of old records, not too much though. How did you first get connected with Yore and 20:20 Vision? What about Clone? Yore began by sending a friendly e-mail through Myspace to Gerd Janson from Running Back, which is a favorite label of ours. He almost immediately responded and said there wasn’t any room for us at RB (as we expected) but that we should try Yore. So we did, rest is history. 20:20 Vision is a label we started to follow from day one. We did send them some tracks after we noticed Ralph Lawson charted our first EP (Forgotten Moments on Yore). Ralph Lawson and Andy Whittaker personally replied within 24 hours. Together we compiled the Dazin’ EP, a double pack. Ralph and the whole 20:20/FINA crew are great people, they don’t push us or tell us what to do. Music-wise we are free to do what we feel. Hope we can give them some fresh music soon. Serge from Clone, a man we didn’t knew in person but respected deeply for his Clone achievements, sent us an e-mail to congratulate us on the aforementioned Dazin’ EP. We were quite surprised as we never dared to send our music to Clone, thinking it wasn’t good enough for the label quality-wise. So when we had some new tracks we were bold and just sent them to Serge and that’s how the edit for Reggie Dokes’ “Once Again” and Fantasy Check on Clone/Royal Oak came about. It speaks for itself that we are very proud to be a little part of that big Clone history. We would love to stick around Clone. The Dutch house/techno scene of which you are a part has been particularly strong over the last few years. Why do you think it’s been fertile ground for so much good dance music? What are your favorite parts of the scene? True, the Dutch house/techno scene seems to be blossoming. In a way it always has, from the late 80s up to now, but not always in a true and cutting edge way. It was either very clubby or gabber, nothing in-between. Now people take notice of producers who have been ignored for many years. However, as strange as it may sound, we don’t consider us a part of this so this called Dutch scene. We both live in a small town all the way down the south of Holland, tucked in between Belgium and German borders, which are both literally a 10-minute car drive from our homes. Of course we did and still follow what is happening “up there.” Clone, Rush Hour and Delsin are true innovators, but when it comes to influences we have say that they came and for the bigger part still come from Germany, Belgium, France and the UK rather than Holland. Besides that, foreign countries were picking us up from almost scratch and up. Until now, Serge was the only one in Holland who was giving us faith and props. Who are some some of your production contemporaries you admire and why? What is the best advice you’ve received with regards to making music? What advice of your would you give to up-and-coming producers? Simply that there are no rules in making music, just do as you feel like, make mistakes and don’t be scared making them. Music was never meant to be perfect or sound like this or that. Go with whatever happens in making a track — it’s a small journey, enjoy it! When you are too focused on a certain sound or goal on what the track should sound like you can miss all the nice and spontaneous things that happen in a production process. We noticed all the times that we want to create a smooth track it can turn out raw and nasty. So, we just go with the flow and things can just fall into place. We try to keep an open mind about the whole process. What’s coming up from you two over the next 12 months? We just finished a remix for Gerd’s 4 Lux label and really looking forward to continue our work with Clone/Royal Oak. The rest is open and we’ll see what the future has in store, no master plan here. When you’re away from the gear and turntables, what do you do for fun? Exellent house podcast for finish this bored 2011 Year. thanks! This pod is soo fresh! Can i download the mix ? @Kaupo, you can download the mix above, it’s the big hyperlinked text above the streaming player.